The Harmony Fire District is a 501c(3) private nonprofit VOLUNTEER organization. Half of our operating budget is funded by donations. These funds pay for life saving equipment that is used while responding to an emergency. We commonly get the question, “I don’t want to volunteer but how can I help?” This is how! Each year the district raffles off a vehicle on Main Street in Zelienople. This year we are raffling off a 2018 Chevrolet Silverado 1500 for first prize and a 2018 Polaris General Side by Side Utility Vehicle as the second prize. The drawing will be held on Main Street at 9:00 PM on September 22nd, 2018. Stop by the truck on Main Street at Grandview to take a look and buy a ticket, or if you would like to purchase tickets online click the button below. Every year we mail out thousands of donation letters to every address in our first due coverage area; Harmony, Jackson, Lancaster, and Zelienople. These letters request a donation to help support our operations. If you have not received one please contact us and we will check on the issue! Help us find you! A reflective address sign is the best way for emergency responders find you when you need us most! It is very common to get dispatched to an address, especially at night, and be delayed minutes trying to find a driveway. 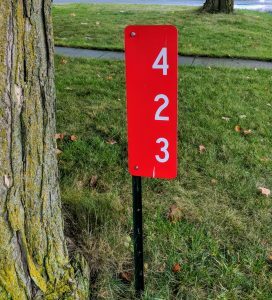 We sell red reflective address signs that can be placed on your home, mail box, or a sign post. Call us at (724)452-4046 or fill out the information below to obtain a sign.